Beautiful stock certificate from the Electric Dice Game Company issued in 1893.This colorful historic document has an ornate border around it with the company's name on top center. This item has the signatures of the Company’s President and Secretary. 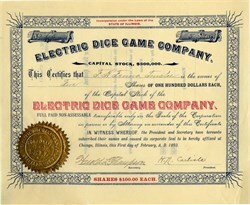 Tne Electric Dice Game Company, of Chicago, III., capital stock $500,000, was formed to manufacture and deal in electrical and mechanical devices.